So far, we have talked about changes in the number of molecules over time as a reaction progresses. The number of reactant molecules decreases as the number of product molecules increases. 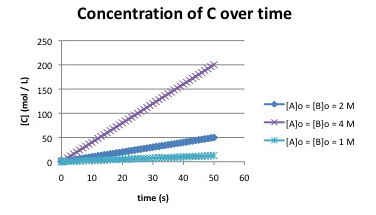 Practically, the easiest way to measure the speed of a reaction is to measure the concentration over time. 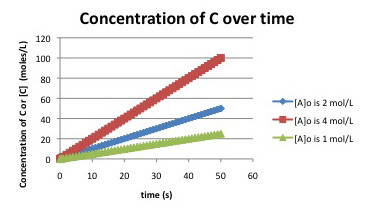 We can measure either the concentration of the reactants or the products. 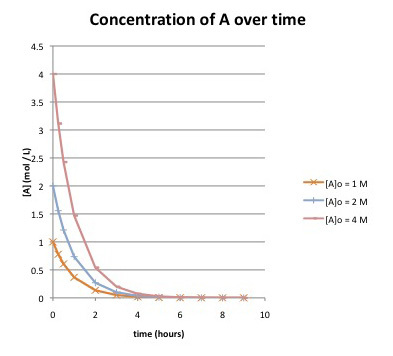 Remember, concentration refers to how densely populated a solution is with a particular compound. Reactions are often monitored by some sort of spectroscopy. In spectroscopy, "light" or some other frequency of electromagnetic radiation shines through a sample in which a reaction is taking place. The light can interact with the molecules in the sample. The molecules absorb particular frequencies of light, so if the light encounters the molecules on its way through the sample, a little of the light at those frequencies is absorbed. Less light makes it all the way through the sample; the amount that does make it through is measured by a detector on the other side. 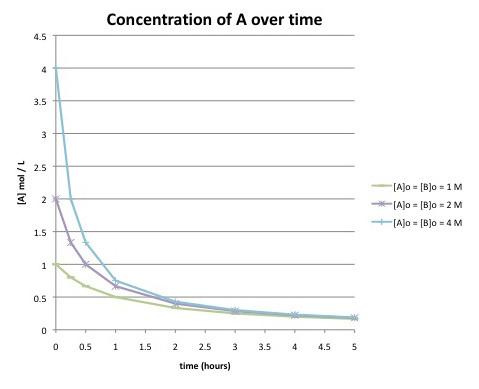 If the concentration of the sample is different, a different amount of light from the spectrometer will be absorbed. For instance, suppose the sample is more concentrated. The more molecules there are, the more light is absorbed. And because the beam of light travels through the sample in a straight line, the more concentrated the solution, the more molecules it will encounter. It is pretty simple to calibrate the instrument to be able to determine concentration from the amount of light absorbed. In addition, the light may interact with the reactant molecules and product molecules in different ways. That means you can monitor the absorption of a frequency that you know is absorbed by reactant molecules, but not by product molecules, and you can detect changes in reactant concentration. You could also do the same thing to detect changes in product concentration.